ECENTLY, I ATTENDED a tremendous concert at the Cathedral Basilica of Ss. Peter & Paul, here in Philadelphia. The hour-long program by Choral Arts Philadelphia presented Rachmaninov’s Opus 37 (often called Vespers, although it is more properly a collection of texts from the All Night Vigil liturgies). The most striking aspect of the program for me came at the Magnificat, which began in Old Church Slavonic: Velichit dusha moya Gospoda. It was not the words, however, that struck me. It was the musical artistry. 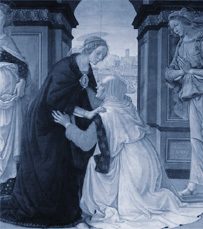 As I sat in the pew preparing to hear the Magnificat section, I was imagining famous paintings of the Visitation—the moment when Mary first uttered this great canticle of praise. I thought I was prepared, but when the singing began, I was stunned. Rachmaninov chooses to place these opening words first on the lips of basses. This seemed a poor fit with all the scenes of the Visitation I had imagined; it would have been better, I thought, to highlight the female voices in this section. All in an instant, though, I changed my mind, because I began to think of the rich symbolism Rachmaninov may have intended. I began to consider how profoundly deep were these sentiments of praise in the heart of the Blessed Lady. Indeed, Mary probably proclaimed Magnificat from the deepest recesses of her immaculate heart. She cried out, I can now imagine, de profundis—“out of the depths” of her soul.